You are here: home > geotopics > volcanoes > what are lahars and pyroclastic flows? The most destructive aspect of volcanoes are lahars and pyroclastic flows. Lahars are volcanic mudflows created when water (from rain or melt water from glaciers) and ash mix. This deadly combination can have devastating results on the surrounding area. When lahars settle they can be metres thick and as hard as cement. Lahars can occur long after a volcanic eruption. Pyroclastic flows are avalanches containing hot volcanic gases, ash and volcanic bombs. 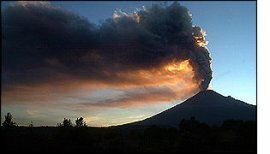 On steep volcanoes pyroclastic flows can reach speeds of over 100 miles per hour.